The SP-P410M projector from Samsung isn't just small (its footprint is smaller than a Mac mini), the light source isn't even a traditional bulb – it's superbright LEDs. That means an end to long warmup times and a projected LED life of more than 30,000 hours. 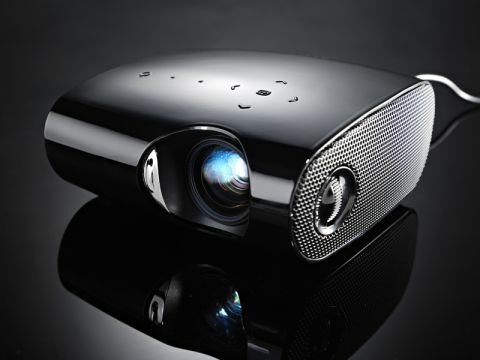 Traditional projectors' bulbs might last anywhere from a couple of hundred to a couple of thousand hours of use before burning out, and they're expensive things to replace; you could expect to shell out anything from £100 to £400 for just a single bulb. A projected life of 30,000 hours is obviously something we couldn't verify; it equates to almost three and a half years of round-the-clock use. That's big news, and might have you looking at that 500 quid price tag a little more kindly. And the size is most impressive. Though the external power brick adds about a third of the projector's volume in bulk, the whole thing comes in a small black satchel that is eminently portable. It's not as small as the new wave of pico projectors, but what you lose in pocketability, you gain in brightness and quality. At 170 lumens, it's more than bright enough for use even with some overhead lighting still on, and while the SVGA resolution (800x600) is pedestrian, it's fine for business and education use. The projected image – anything from 20 to 80 inches, depending on the throw distance (69cm to 2.8m) – is excellent. We'd like it to be brighter, and the DLP technology can cause irritating RGB ghosting as you shift your gaze, but it demonstrates little of the hideous colour bleaching of some projectors. It accepts only VGA input plus composite video, and, annoyingly, the audio input for the respectable 1W speakers is the red/white phono type rather than a 3.5mm jack, but there are compensations. There's a tripod thread on the underside, and a USB port lets you plug in a flash drive loaded with media and control their playback with the included remote. JPEGs work fine, though we struggled to find compatible movie formats.